“Entrepreneurship is a key cornerstone of our distinctive programs, and we are thrilled to partner with organizations like the Burton D. Morgan Foundation. LaunchNET’s mission of inspiring innovation directly connects to our Jesuit Catholic mission and heritage,” said JCU President Michael Johnson at the opening ceremony of the NEOLaunchNET. 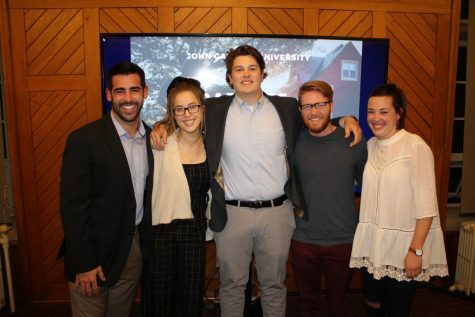 John Carroll University’s entrepreneurship minor has officially joined the NEOLaunchNET program, which is aimed at all majors and designed to boost innovation on college campuses in Northeast Ohio. The program provides mentorship, coaching and access to resources for students to work on personal entrepreneurship ventures. “The beauty of LaunchNET is that it takes ideas that are not being developed for a classroom but outside the classroom, or something maybe you did in class but didn’t get to develop it as far as you’d like, and you say, ‘I wish I really could have developed that,’” said JCU communication professor Jacqueline Schmidt. 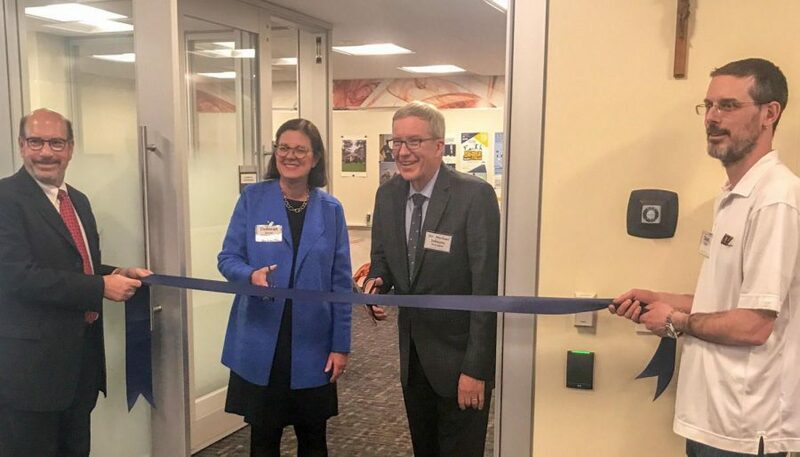 Johnson ceremoniously cut the ribbon to reveal the new creativity and entrepreneurship classroom in the basement of Grasselli Library at the official opening event on Feb. 6. Carroll students will join those from other universities and colleges in the area — including Baldwin Wallace, Case Western Reserve, Kent State and Lorain County Community College — in becoming members of NEOLaunchNET. JCU students, faculty and representatives from the Burton D. Morgan Foundation as well as delegates from Baldwin Wallace, Case Western Reserve and LCCC were in attendance at the opening event. The Burton D. Morgan Foundation, established in 1967, is a non-profit organization aiming to advocate and support the entrepreneurial spirit of Northeast Ohio residents. NEOLaunchNET, started in 2012, has helped more than 4,100 students delve into over 3,000 entrepreneurial projects, according to JCU’s news release. Another aspect of the program is that students can work at their own pace on their self-designed projects with the help of a mentor knowledgeable in the area the student is working with. “We try to mentor you or match you with someone who has a specific knowledge. For example, if you have something where you’re trying to hit a certain market or a certain group of people, we’ll look into our database and see who might have some extra special expertise on that, and then we try to connect you them and prepare you for that meeting,” said Schmidt.